Hello everyone, it has been a while since I have written a post. Life has been busy and I have been experimenting. In my January post titled, Could a low carb diet be sabotaging your weight loss? I shared information about how some experts believe that a very low carb diet is not always the best solution for some people, especially women. It can mess with our hormones and create a stress response in the body, which leads to excess cortisol and weight gain or weight loss resistance. I thought you might be interested in my experience over the past few months of trying a slightly higher carb intake. I want to clarify that I am still following a low carb diet but not a very low carb ketogenic one. First off, I have to say that I have really enjoyed the increased variety of foods. Adding some beans, legumes, butternut and sweet potato, a few times a week, has offered a different culinary experience, which my taste buds have really enjoyed. I was fascinated to see how this experiment affected my Crossfit workouts. It seems to have had a very positive impact on my performance as I can lift heavier and go faster. I even upped the number of workouts to 4 to 5 times a week. I think for weight training and high intensity interval training, slightly more carbs in my diet has helped. I can still workout in a fasted state, which I am pleased about, as this is supposed to be excellent for fat burning. I am however still of the belief that a ketogenic diet can be very useful for endurance athletes. My menstrual cycle has become a lot easier to manage. It has gone from a 30-day cycle to a more regular 28 days. I experience far less PMS and the day 1 cramping (that always saw me reaching for the Panado) has significantly reduced. I also used to get quite bad ovulation cramps and bloating, which I haven’t had the last couple of months. I can’t be sure whether these changes are mainly due to upping the carbs, which has perhaps improved my hormonal balance, or whether the Evening Primrose Oil and herbal Vitex drops I have been taking has also played a part. It could be a combination of all of the above in this case. Despite eating a very low carb diet for the last couple of years, I still struggled to get my fasting glucose below 6. It now tests in the low 5’s and yesterday I got a 4.6 reading which really thrilled me. Perhaps adding back a few more carbs has been gentler on my adrenals. One likely explanation is that my body might be producing less cortisol (since it no longer has the dietary stressor of a very low carb diet). Less cortisol means less blood sugar. Since adopting a healthier real foods way of eating a few years ago, my process of elimination has never really been an issue. It just seems more optimal now. It might be that the little bit of beans and legumes are providing more fibre, or perhaps it is because these foods have been feeding very specific microbes in my gut and they are happier now. The bottom-line is that I am as regular as clockwork and sometimes even manage to go twice in one day. I never thought that was possible! Sorry if I am over-sharing here, but these things are important to talk about as they really do impact on our overall general health. Perhaps the extra fibre is also enabling my body to excrete more of my used estrogen instead of re-cycling it. This can really help avoid estrogen dominance. So, here is the big question. Has this experiment had any impact on my weight? If I use the scale as a measurement, then my answer is “No”; I have not lost weight according to the scale. But, if I go on measurements and how my clothes are feeling then I would have to say, “Yes.” Due to lifting heavier at gym, I feel like I have gained a significant amount of muscle mass, which leads me to think that I have burned some fat off. I wish that the results in this department could have been more dramatic but no such luck. It is very easy to let an experiment of “adding in a few extra carbs” turn into a “free for all carb festival.” No one wants to go down the dreaded slippery slope back into cravings and hunger. One really has to be careful to avoid this happening. It is a fine balance and perhaps I didn’t always get it right, but I learned from those experiences and got back on track. I have also been reading a lot about the importance of sleep and how vital it is for good health. My goal has been to go to bed by 9:30 and be asleep by 10:00. This allows my body to receive 8 hours of restorative sleep a night. Studies show that those who are not getting the optimal number of hours of sleep a night struggle more with their weight. I have even started including an Epsom salt bath and some deep breathing techniques into my bedtime routine to help manage my stress and cortisol levels. Epsom salts contains magnesium and sulphate. These minerals have very powerful health benefits that can enhance the detoxification capabilities of the body, when absorbed through the skin during a bath. I am now going to be adding some essential oils like lavender and ylang ylang to my bath as they are supposed to be great for reducing stress and aiding good quality sleep. I believe that optimal health requires a multi-faceted approach. A healthy body will also more readily lose the excess weight. Therefore my goal is to understand this body of mine better and to really honour it. Food is vitally important in the equation, but there are other things that also need attention. Did you know that our thoughts and emotions impact our health? Or that stress makes our bodies feel unsafe at a molecular level? Did you know that 90% of our serotonin (a chemical that contributes to wellbeing and happiness) is released in the gut? So, if you have poor gut health, you could suffer from depression or anxiety disorders. How about the fact that the wrong type and duration of exercise can actually do your body more harm than good and can actually age you beyond your years. Chemicals in our environment, cosmetics and food, place a huge toxic burden on our bodies and raise our risk of cancer. Yet we continue to buy various household cleaning products when water, vinegar and Bicarbonate of soda would be a much healthier choice. I learned this week that music played at specific frequencies has the power to heal. The Ancients and Gregorian monks knew this a very long time ago. We have managed to lose this wisdom through the centuries. There is so much to know and I feel I am only at the beginning of this learning journey. But my goodness what a fascinating ride it is turning out to be. PS: The snake isn’t mine. The python was a guest at a party my daughter went to. 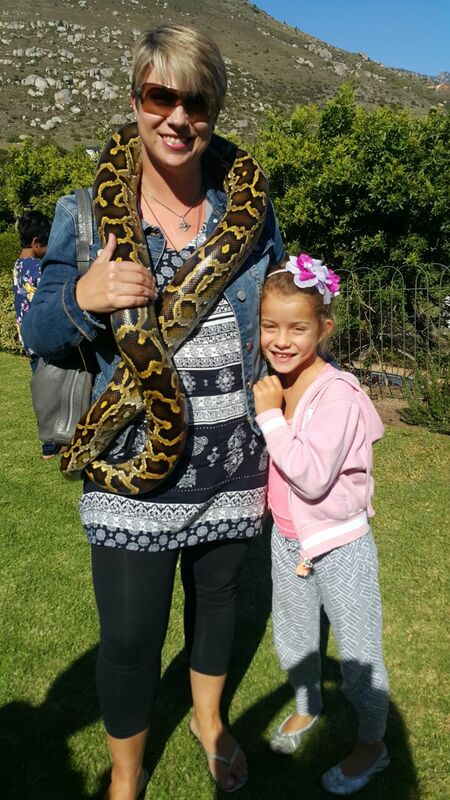 I have such a huge fear of snakes that I challenged myself to put it around my neck. Life should be about pushing the boundaries of your comfort zone. In this way we redefine what is possible. Posted on April 29, 2016, in Primal 101 and tagged an update, beyond food, exercise and carbs, health, low carb a stressor, low carbs and adrenals, Nicky Perks. Bookmark the permalink. 2 Comments. Excellent post Nicky, thank you for the regular feedback, you’re always so insightful and encouraging. And you look fantastic! Thanks so much Lynette. I am feeling healthy and strong.